Malabar spinach is the plant to grow to fit the niche for “summer greens” in your garden. I grow kale and collards through the winter for greens to harvest fresh for our dinner table from fall to spring, but they don’t do well in hot weather. Neither does regular spinach, which likes the same cool temperatures as kale and collards. Despite its name, Malabar spinach (Basella alba or Basella rubra) is not related to regular spinach (Spinacia oleracea). 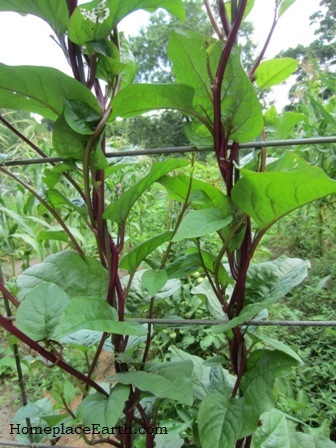 When ordering seeds in early 2013, I saw Malabar spinach offered in a seed catalog and ordered it. What I didn’t know is that there are two types of Malabar spinach. What I bought was green Malabar (Basella alba). What I was anticipating was red Malabar (Basella rubra). My 2013 crop of Malabar spinach had thick green stems and didn’t climb well. In fact, it was slow to grow at the beginning of the summer. Later in the summer it was abundant, but it never grew as tall as the red variety. I’ve had the pleasure of taking a sneak peek at David Kennedy’s upcoming book Eat Your Greens: the surprising power of homegrown leaf crops, published by New Society and due to be in the bookstores about October 1. Kennedy, who refers to this crop as vine spinach, says the red variety produces best in early to mid summer and the green variety produces best in late summer to fall. Both varieties will succumb to frost. That explains why not much was happening with my Malabar spinach early in the summer last year when I was anxious to have it take off up the trellis. Red Malabar spinach on a trellis. This year I am growing the red variety of Malabar spinach and am pleased with it. I planted the seed at the base of both sides of my trellis, but something happened to keep it from growing on one side. Many things this summer have kept me distracted and failing to replant when necessary, so that side never got replanted. The side that it is growing on looks great! I can pick the leaves from a standing position as I walk through my garden, harvesting this and that for dinner. Those red stems are edible, also. The path between two sections in my garden is behind the climbing spinach you see in the photo. As you can see, it climbs the trellis well, providing shade to the path, and is colorful. I just have to smile when I see it. If I would have given this crop any attention at all, other than putting the seeds in the ground one time, I would have had Malabar spinach coming up over the top of the trellis from the other side. My friend Brent tells me that it reseeds readily, so to expect volunteers to pop up next year. In his book, David Kennedy says the red variety will do that, but the green variety often flowers too late to produce viable seed before frost. Malabar spinach is an easy-to-care-for crop in my garden. 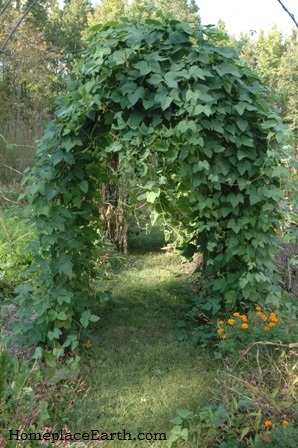 The only attention I have given it is to redirect the vines to the trellis when they stray into the path. 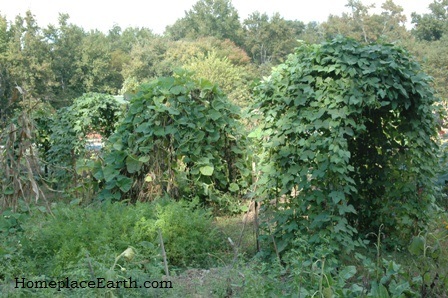 This crop doesn’t have the tendrils to reach out and grab the trellis that squash plants have. If you want to add a tasty addition to your garden that thrives in hot weather, I encourage you to plant Malabar spinach. Last year I grew pole lima beans for the first time. I had several tall bamboo tepees in a garden bed with a bamboo pole connecting them along the top. The plants grew up the poles and along that top bar with a mass of foliage. I felt the urge to step into the welcoming shade, but I would have had to step in the bed. That’s when I had the idea to grow them so they would grow over a garden path, rather than the garden bed. My large garden is divided into four sections of nine 4’x20’ beds each, with a 4’ wide grass path between each section. I decided to connect five pairs of beds with trellises over the path between two sections. Each trellis was made with four metal t-posts and a 16’ livestock panel. The posts were put at the corners of the beds and the fence panel was bent between them and attached to the posts with wire. I use old electric fence wire for things like that. You could put all four posts in at once, then with a helper, bend the panel and slide it between the posts. Or, you could put in three posts, add the panel, then sink the fourth post and adjust the panel. I wrote about using these livestock panels many ways at https://homeplaceearth.wordpress.com/2012/04/17/in-praise-of-livestock-panels/. It is no trouble to bend them into shape. Just anchor one end against something (a post or a person) and pick up the other end and walk forward. The 16’ long panel made an arch 7’ tall over the 4’ wide path. At 52” wide, this trellis is slightly wider than the garden bed, which is why I didn’t trellis every pair of beds along that path. It would have been too crowded getting in and out of the 1½’ wide paths between the beds. In deciding what to plant over these trellises besides lima beans, I chose luffas and bushel gourds because I knew they would put out lots of vines that would last till frost. 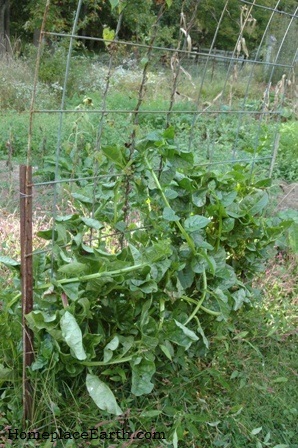 It is interesting to try new crops, so I also chose Malabar spinach for one of the trellises. Friends and family who had grown Malabar spinach told of how it climbed over everything in their gardens and I imagined I could just go out and pluck some leaves as needed for dinner from a trellis as I strolled through the garden. I learned that the variety that climbs over everything is Red Malabar. The variety I bought was green and didn’t do much climbing. I still took a walk in the garden and picked for the dinner table as needed, but next year I’ll be planting Red Malabar to fill out the trellis. 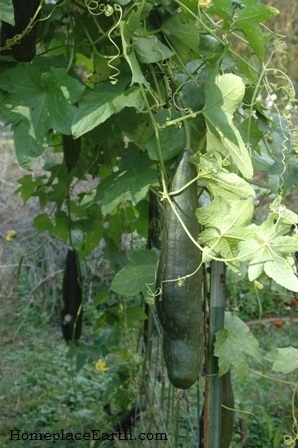 I knew bushel gourds were good for lots of green vines. In fact, if you don’t watch out, they can get away from you. I had some growing 10’ into the beds on each side of the trellis before I cut them back. I let them go a little wild and some vines hung down so far over the ends of the trellis into the path that under that trellis would have made a good meditation shed or a children’s playhouse. As a bonus I’ll have five large gourds to play with. I finally cut the overhanging foliage with a machete and fed it to the compost pile. 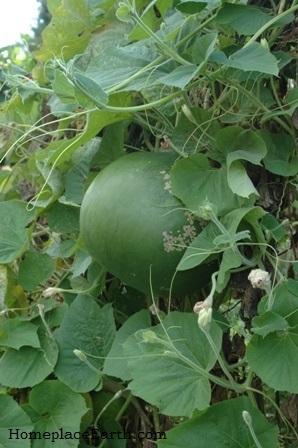 The luffa and bushel gourd plants will stay green until the frost kills them. Winter squash would probably finish earlier. 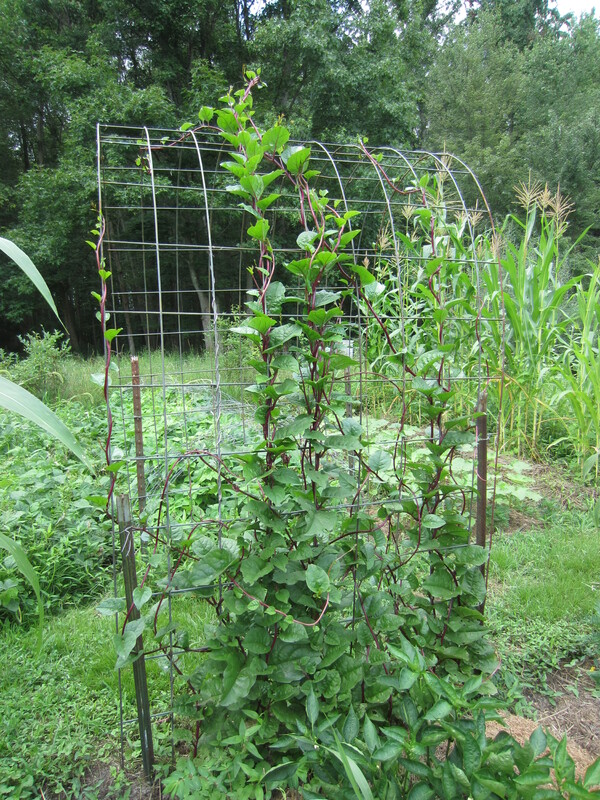 That could be an advantage if you grew them over a trellis such as this, but then wanted them to be gone so you could cover the trellis with plastic to make a winter greenhouse. Seminole squash vines are pretty prolific. The description for Seminole in Southern Exposure Seed Exchange (SESE) catalog subtly warns about that when it says to give it “room to roam”. This all started with lima beans. The variety of pole limas that I grow are Worchester Indian Red Pole. The description in the SESE catalog designates it as the hardiest lima and says it is heat and drought resistant. These are the ones I grew last year and saved the seeds. 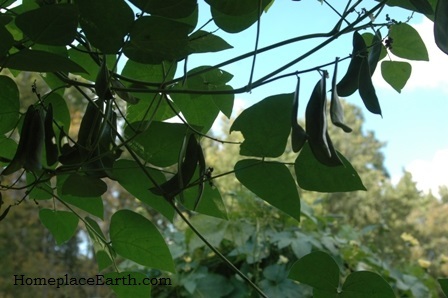 I let the seeds dry in the pods on the vines, so I haven’t picked any yet, but they will certainly be easy to see and pick. This has been fun this year and I’m already looking forward to doing it again next year. It is rather magical to walk under these trellises in the garden as I go about my regular work. I enjoyed the shade in the paths and didn’t notice any problems with shading in the beds because of the trellises. I already had these fence panels and old t-posts left from other projects. Buying everything new could get pricey, so use what you have, but make sure your trellises are sturdy. If you want to try this next year, plan for it now. In fact, as you clean up your beds and plant cover crops, put the trellises in now so they’ll be ready. I hope you have as much fun with this as I did!